Free Model Boat Plans - Where to Get Them. Free Model Boat Plans - A compiled list to help you locate free model ship and boat plans for model building - Static, scale, RC, power, gas, sailing, steam and submarines. You can find free model boat plans on the internet. Here is what I've been able to locate so far of decent quality. I've tried really hard to filter out sites that seem suspicious in terms of copyright infringements – I’m trying to hold the standard high. 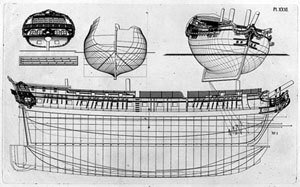 Fregate plan from F.H. Chapman's Architectura Navalis Mercatoria available as a free image download from ChapmanNet. The Architectura Navalis Mercatoria by Fredrik H. af Chapman is available online for free from the ChapmanNet. The ship plans are superb and is a great reference. This is probably the best collection of 18th century ship plans anywhere. There is no rigging shown in this book, so you need to find that elsewhere. It should not pose much of a problem, as there are many specialized book on the subject. The book consists of 62 plates (with a total of 145 ship plans) of 18th century ships, complete with sections and general arrangement views typical of the times. Considering the value of the plans in this book, its content is great value even if you have to pay for it. Personally, I like to be able to flip through the pages, so I bought one of the many relatively recent editions. There are a myriad of facsimile editions readily available. Many can be purchased through my Architectura Navalis Mercatoria page. Orlogsbasen is a searchable, online ship plan database provided by the Danish National Archives and the Royal Danish Naval Museum. The subjects are original plans in the archives from the age of sail of Danish, Swedish, English and French ships - mostly from the 17th through 19th century. The database also contains photographs of period ship models that the involved institutions possess. The database is under construction. The Czech MoNaKo is also a hobby and model builder’s magazine. They offer three pages of plans – only two of which are currently accessible. The quality of the plans offered varies, so study them carefully and do your own due diligence. The subjects range from battleships, destroyers, cruisers, submarines, sail boats, motorboats, tugs etc. Some show construction details, while others seem to be missing pages, some are clearly intended for RC, and it’s all in Czech. Enjoy! If you want to build a planing hull scale model, consider a PT boat. The acronym stands for Patrol Torpedo and it was the US answer to what is otherwise known as a motor torpedo boat. The Dreadnought Project offers 300dpi scans of original plans from German warships from the Imperial era to WW2. Most are oddball ships that most have never heard of. The plans can be a single sheet to several deck layout, profiles and cross sections. To my knowledge, there are no lines plans. Nevertheless, an extremely valuable resource if this is your field of interest. I was never under the impression that the French Government was all that helpful to its citizens until I stumbled upon this website. Wooden warships, mostly French but also some foreign nations. Iron and steel warships, late 19th century, both world wars, cold war etc. The plan sets are not always complete, but most provide more than you'd expect for model boat building. They offer plans for all kinds of ships, such as Ships-of-the-line, Frigates, Battleships, Cruisers, Destroyers, Submarines, Carriers and Torpedo boats. Some surprises include tugs, minesweepers, landing crafts, steam frigates etc. The site as well as plans are in French, so be warned. Note: This service has been disrupted. I have no further information at this time. If anyone knows what is going on, please pass me a note here and I'll post it on this page. Thank you.